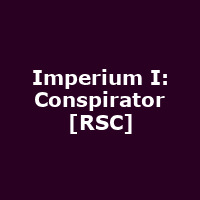 "The Royal Shakespeare Company (RSC) and Playful Productions are delighted to announce the West End transfer for acclaimed, historical two-part thriller Imperium - I: Conspirator and II: Dictator. Robert Harris' best-selling Cicero trilogy is adapted for the stage by Mike Poulton as six one-act plays, presented in two performances, each with two intervals. Told through the watchful eyes of Cicero's loyal secretary, Imperium - I: Conspirator chronicles how the great orator's early success unwittingly paves the way for a brutal and bloody end to the Republic. With Rome in chaos at the beginning of Imperium- II: Dictator, Cicero must use all his brilliance to restore the power of the Senate from the civic mob and their would-be Emperor: one Gaius Julius Caesar."